It is a good resource for those who want to learn and development Turkish. You will find the world culture in this book. 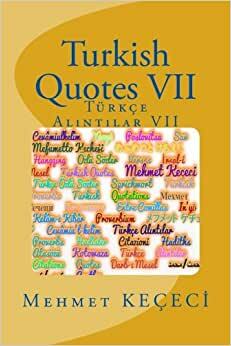 Turkish Quotes, Quotations, Proverbs, Poslovitsa, Proverbium, Sprichwort, kotowaza, Citations, Entre Comillas, Citazioni, Inyo, Yanyu, Hangqing, Verses, Hadiths. Turkce Alintilar, Ozlu Sozler, Ata Sozleri, Ayetler, Hadisler. Dunya kulturunu bulabileceginiz bir kitaptir. Turkce ogrenmek ve Turkcelerini gelistirmek isteyenler icin iyi bir kaynaktir. Mehmet Kececi, Mehmet Kececi Fizik Bilim Uzman Master of Science in Physics (MSc.) Portion of Lesson is finished 2001-2003 (PhD. Doctorate - Physics)"